All of our products are 100% organic, the majority of which are gathered and collected from their wild habitat. Unuchu Spa offers unique water treatments and massage therapy in an exclusive, private and enchanting ambience. 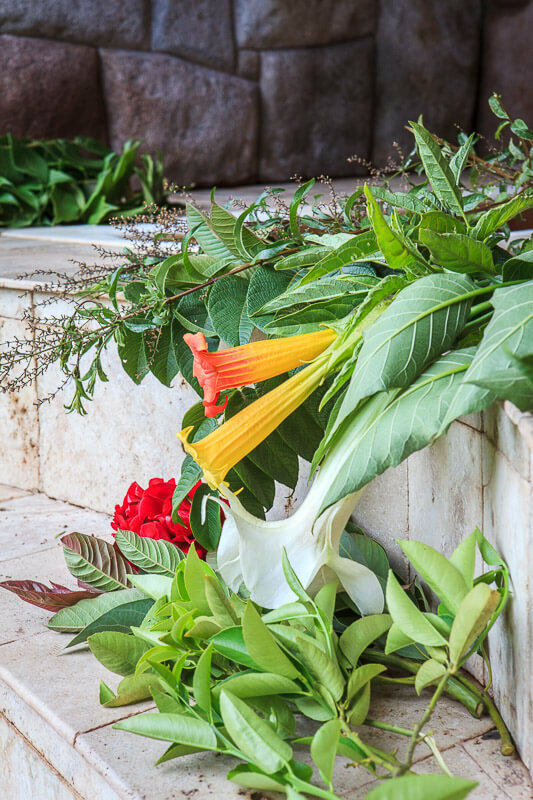 A myriad of medicinal plants used since ancient times, the presence of purification baths in all the sacred Inca sites, and the abundance of natural hot springs in the Andes, are the ancestral legacy of a pre-Columbian healing tradition. Unucha Spa continues this ancestral healing knowledge, offering you the following treatments. The outdoor baths prepared with aromatic and medicinal herbs are an elixir for the body, giving a deep relaxation that reaches the spiritual plane. 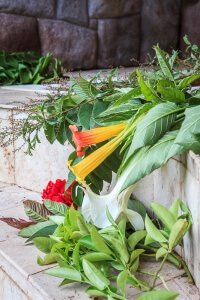 Master plants such as brugmansias, datura, coca and sage combined with lime leaves, walnut, red pepper, malva, wild roses and others permeate the skin with their healing properties, neutralizing emotional stress. Let the excellence and expertise of our masseuse harmonize your meridians during a shiatsu style massage that provides deep relaxation and a peaceful integration with tellurian Andean power. Our sauna, inspired by the Sweat lodge, uses heated volcanic rocks so that when you drop water, at your own discretion, you can enjoy the steam that emanates from them. A few drops of eucalyptus or wild mint essential oil will be inhaled allowing the air to reach your lungs like never before. An additional treatment inside the sauna using pre-Columbian Maras salt will activate circulation while toning and exfoliating. Enjoy incredible views of the majestic mountains while receiving a hydro massage. A minimum four-hour notice required Packages Sauna, herbal bath, and massage sauna at same time, then one in bath while other in massage Herbal bath, and massage one in bath while other in massage Sauna with exfoliation, and herbal bath Hydrate with a complimentary detoxifying herbal tea while you enjoy your treatment. Hydrate with a complimentary detoxifying herbal tea while you enjoy your treatment..
Reservations and payment must be made at Pisac Inn. 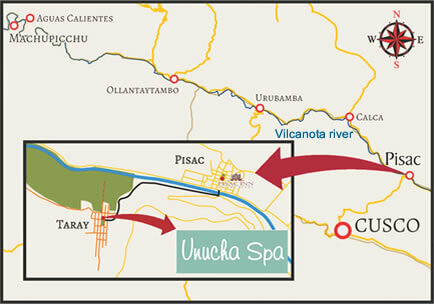 Unucha Spa attends only on a reservation basis. We suggest reservations in advance to secure availability, but accept last minute reservations with a minimum two-hour notice required, and four hours for Jacuzzi. Please leave gratuity at Unucha Spa. Special requests will be attended when possible, and may require additional fees. 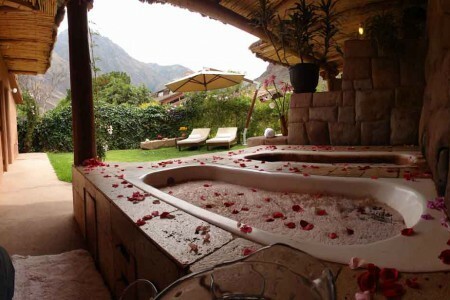 Unuchu Spa is located five minutes from Pisac in the small town of Taray. 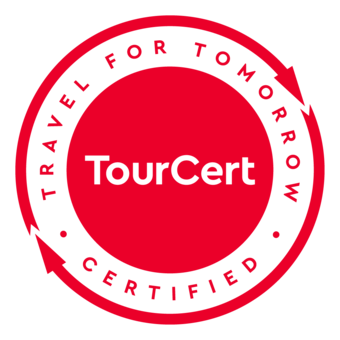 We can help make transportation arrangements, cost not included. There will be a 30% charge for cancellations or changes. No shows 100% charge. Drinking water, bathing suit, sandals and something warm to wear after the treatment. Towel, robe, bath amenities and herbal tea provided. Please do not bring valuables. Late arrivals will result in a shortened spa experience, as your treatment will conclude at the scheduled time to respect following reservations. Unucha Spa is open-air. Only the massage room and sauna are fully enclosed. Spa services for all packages must be booked prior to arrival to ensure availability. Tax and gratuity additional. Packages cannot be combined with any other offer or special. Rates are subject to change without notice. your body. If you are pregnant or have health problems please consult your healthcare professional before your treatment. Use of spa is at own risk and responsibility. Natural herbal baths may discolor some jewelry or stain some fabrics. Unucha Spa will not be held responsible for injuries or loss of personal belongings. Pets are not allowed. 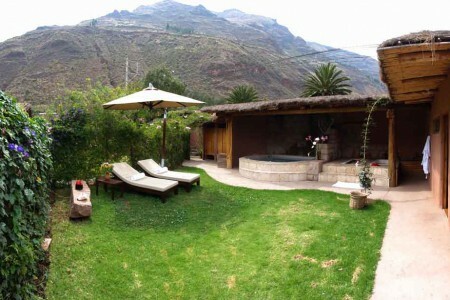 Please make reservations at Pisac Inn in person, by phone or by email. We recommend scheduling spa services in advance to ensure desired times and treatments. We accommodate last minute reservations when possible with a minimum two-hour notice required, and four hours for jacuzzi. 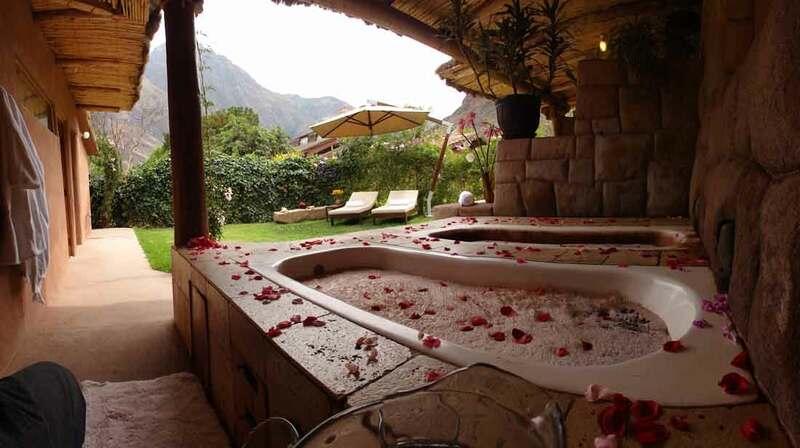 Reservations for spa services must be guaranteed by payment in full at Pisac Inn at time of making reservation. Special requests will be attended with prior arrangements when possible, and may require additional fees. Please arrive 10 minutes prior to your scheduled appointment to allow time for check-in, and to shower before your treatment. Please remember, we open the door ten minutes before each appointment, so if you arrive more than ten-minutes early we will be attending another guest, or preparing for your treatment. 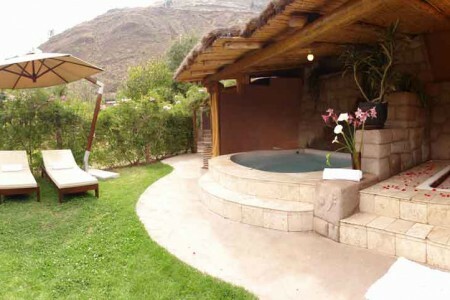 Unucha Spa does not attend on certain holidays and special Andean celebrations. We attend strictly on a reservation basis, and only open when we have a reservation; no one is at Unucha Spa to attend unless an appointment has been made at Pisac Inn. There will be a 30% charge for cancellations or changes; no shows 100% charge. Please understand that each treatment requires several hours of preparation from collecting the plants, to heating the water, and getting the space ready. Gratuities are not included in the price of treatments and are gratefully received to acknowledge good service. The typical range is 15-20% of the price of the treatment(s) and may be made in cash at Unucha Spa. All guests will receive a robe, towel, and bath amenities to use during your stay, and a complimentary detox herbal tea. Please bring drinking water, bathing suit for herbal bath, sauna and jacuzzi (not required), and something warm to wear for after the treatment. Please do not bring valuables. consumption of alcoholic beverages may impair judgment and/or cause loss of consciousness and is strongly discouraged. Natural herbal water may discolor some jewelry and stain some fabrics. Unucha Spa will not be held responsible for injuries or loss of personal belongings. 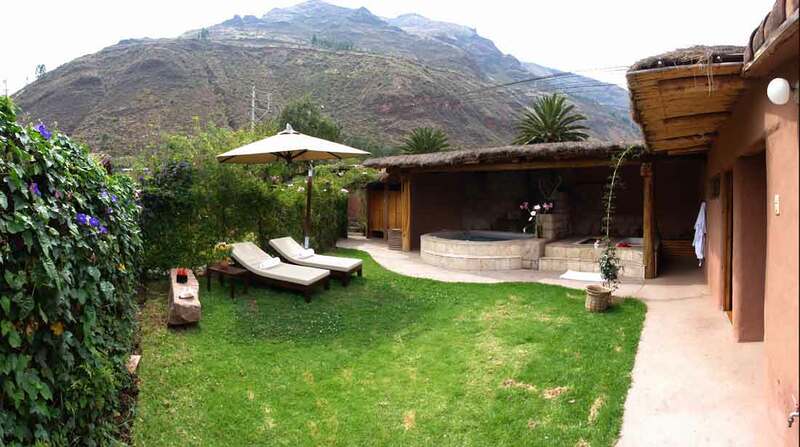 Unucha Spa is located five minutes from Pisac in the small town of Taray. It is a twenty-minute walk from Pisac, a five-minute motor taxi drive, or a three-minute taxi drive. Pisac Inn can assist making transportation arrangements; cost not included. It is a red door in the rock wall on the main plaza at the motor taxi drop off; there is no sign and no bell. The door will be opened ten minutes before your scheduled appointment; Unucha Spa only opens and attends on a reservation basis, which means there is no one available to attend if a reservation has not been made. What makes Unucha Spa unique? Here are few things we have thought of to help you better understand our distinct spa concept, and how to be prepared. Unucha offers a personalized and intimate space for each reservation. Reservations do not overlap, ensuring that each guest has exclusive use of the space. This affords privacy and security for each treatment offered at Unucha Spa. Unucha is an outdoor open-air spa, with spectacular views in a natural setting, providing a gentle space that allows one to connect to oneself and to nature. We use organic massage oil, and prepare each treatment with plants locally and sustainably harvested in the moment. Please note that only the massage room and sauna are fully enclosed; we recommend bringing warm clothes fro after treatments. Unucha Spa is small and charming, providing a quality experience. Please understand that our facility can only accommodate a few reservations per day. We highly recommend making a reservation far in advance to assure that you are able to get a reservation. Oftentimes we are fully booked. Part of the charm of being in a small town in the Andes comes with several factors that may prevent us from being able to take a reservation, and sometimes we may even have to cancel a reservation in the event of loss of electricity, problems with water systems, and any numbers of unforeseen events. We thank you for your understanding. We will always reimburse your money if we are unable to attend a confirmed reservation.